On Saturday September 21, Victor Martinez played the last game of his 16 year career in Major League Baseball. Martinez started at First Base for the Tigers and hit an infield single into the shift in the bottom of the first inning, ending his career with a base hit. The Venezuela native spent the first half of his career mostly as a Catcher with the Cleveland Indians (2002-2009). In 2009, he was traded to the Boston Red Sox where he would play through the 2010 season, before signing with the Tigers in 2011. Martinez (known as V-Mart) occupied (for the most part) the Designated Hitter role in his years in Detroit. He’s a five time American League All-Star (2004, 2007, 2009, 2010, 2014), two time Silver Slugger (2004, 2014) and won the Edgar Martinez Award (2014). The switch hitter finishes his career with 2,153 hits, 246 Home Runs, 1,178 RBIs, a .295 Batting Average and an .815 OPS. He hit over 20 HRs in seven seasons and over 100 RBIs in five seasons. He led MLB in OPS in 2014 (.974). While his numbers may not quite get him a plaque in Cooperstown, his career success certainly places him in the ranks of the best Venezuelan born players of all-time. 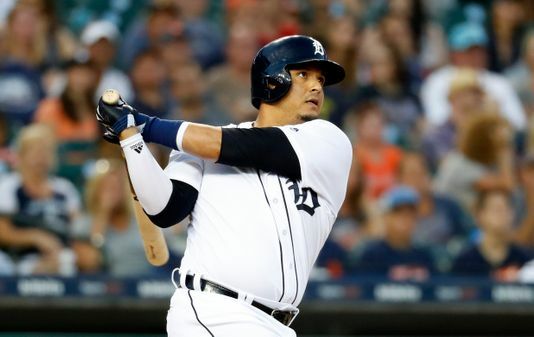 While the baseball world may not know much about the life of V-Mart, a recent episode of the 619 Podcast (hosted by Tigers players Nick Castellanos and Shane Greene) shined some light on V-Mart’s career and personal life. The 39 year old spoke candidly about his childhood in Venezuela, playing ball with neighborhood kids and making gloves out of orange juice cartons, his minor league experience and balancing his family life (wife and four children) with his playing career. Castellanos also talked about V-Mart’s intense approach to hitting and his focus on putting the ball in play. Something more players can learn from in the game today. His retirement plans? Coaching? Sportscasting? Try cattle ranching. Martinez owns 2,400 acres near Okeechobee, Florida, where he will dedicate his future to raising livestock (I may need some V-Mart steaks in the near future). The Tigers held a retirement ceremony for Martinez prior to Saturday’s game, presenting him with several commemorative items, including a pair of customized cowboy boots and saddle. The Indians also paid him a tribute during the Tigers final series in Cleveland last weekend. As expected, both events drew an emotional reaction from Martinez and you could see the admiration and respect his teammates (and fans) had for the man and his career in baseball. Thanks for the memories V-Mart.